strength and weaknesses of those jostling for the party’s highest office come December 9. So far, eight candidates have signified their intentions to run for the office of national chairman: six from the South-West and two from the South-South geopolitical zone. Those from the South-West are Bode George, Jimi Agbaje, Gbenga Daniel, Tunde Adeniran, Taoheed Adedoja and Rashidi Ladoja. The other two from the South-South are Raymond Dokpesi and Uche Secondus. A retired naval officer, Mr. George was military governor of Ondo State from 1988 to 1990 under former military ruler, Ibrahim Babangida. He went into private business and politics after retirement and was a founding member of the PDP. He was appointed chairman of the board of Nigerian Ports Authority in 1999 by President Olusegun Obasanjo. He was also at various times the national vice chairman of the PDP in the south west, deputy national chairman, South and the national deputy chairman of the party. Mr. George got into trouble after his tenure as NPA Chairman was investigated by the Economic and Financial Crimes Commission (EFCC) in 2008. A Lagos High Court on October 26, 2009 sentenced him and five others to 28 years jail term for contract splitting and inflation. However, the Supreme Court on December 13, 2013 quashed his conviction. Mr. George’s major strength is his experience, having held various top party and government positions. He also appears to enjoy the support of the founding fathers of the party who prefer an older, more experienced personality, to run the party. However, while, age and experience appear to be an asset, the same may be Mr. George’s undoing. Quite a number of PDP faithful have been clamouring for a younger national chairman in line with the new aspiration of the party. Many are of the view that the party needs a young and vibrant person that would have the energy to lead the party effectively not just as an opposition party, but as a government-in-waiting. Before the scandal that rocked the PDP during its national convention in Port Harcourt, Rivers State, in 2015, Jimi Agbaje was considered to have the highest chance of emerging the new chairman of the PDP.Mr. Agbaje was the governorship candidate of the PDP for Lagos State during the 2015 election where he lost to incumbent Akinwumi Ambode of the All Progressives Congress. He was also a candidate in the 2007 governorship election under a then newly formed party, the Democratic Peoples Alliance, DPA. A pharmacist by training, Mr. Agbaje ventured into politics after the annulment of the June 12, 1993 presidential election by Ibrahim Babangida won by late Moshood Abiola. He was also an active member of the Yoruba socio-political group, Afenifere, where he served as national treasurer. Mr. Agbaje is one of those expected to throw their hats into the ring immediately after the Supreme Court verdict that restored sanity to the PDP. However, he only publicly declared his intention to seek the national chairman’s office last week. Whether that will affect his chances remains to be seen. Mr. Agbaje’s major strength is that he appears to be trusted by most who play the game of politics with him. He is a man that many hawks appear confident working with. Critics, however, say the Lagos-born politician has a stubborn streak and always stick to his guns. That may be a minus for a party trying to return to power in 2019. Gbenga Daniel is the immediate past governor of Ogun State. He held office from May 29, 2003 to May 29, 2011. He is the longest serving governor of the state to date. Mr. Daniel is an engineer by training and a fellow of the Nigerian Society of Engineers. He also taught Engineering at the Lagos State Polytechnic. Since he left office as governor, Mr. Daniel returned to his private business and also set up a “Political Academy” in his native Ogun state. Through the academy, Mr. Daniel has reportedly been teaching youth across the state the history of Nigeria and its political processes. He once left the PDP for Labour party after clashing with Buruji Kashamu, a senator, over control of the PDP in Ogun state. Mr. Daniel returned to the PDP in October 2014. He is one of the strongest candidates for chairman and has been able to get the support of a lot of powers that be in the PDP. He also more than most candidates appears to be reaching out directly to elements within the PDP. His campaign enjoys wide media coverage compared to the rest. As a former governor, sources within the PDP also say he enjoys the support of many serving and former governors. That support is key because governors appear to always have their way in PDP politics. Mr. Daniel’s weakness appears to be the persistent crisis affecting the PDP not just in Ogun, but the South-west generally of which he appears to be a major player. Mr. Adeniran is a former Minister of Education and a professor of political science. He was also a Nigerian Ambassador to Germany and a former Chairman of the board of Universal Basic Education Commission, UBEC. Mr. Adeniran is a founding member of the PDP. Mr. Adeniran chaired the presidential Inauguration committee of Olusegun Obasanjo’s in 1999. Unlike many top PDP members, Mr. Adeniran never defected to another political party. He has also remained visible in all the happenings within the PDP. Generally regarded as a “Gentleman”, Mr. Adeniran is seen by many PDP faithful as a loyal party member who means well for the progress of the party. He is also seen as someone with the intellect and charisma needed for the party to forge ahead. However, these character traits appear to be Mr. Adeniran’s weakness. Critics are quick to point out that the next chairman of the PDP should be someone ready to “fight dirty”. 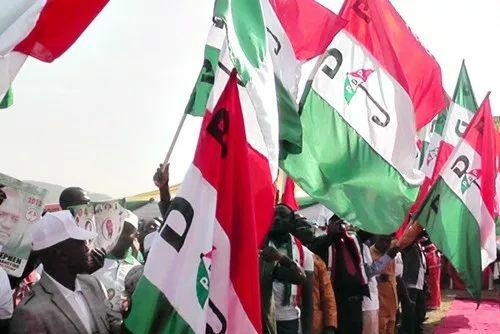 Many are of the view that PDP is not currently giving the APC the kind of opposition expected, owing to the “gentle” nature of the man at the helm of affairs, Ahmed Makarfi. For Mr. Adeniran to convince delegates he has what it takes to lead the party, he needs to convince them of his ability to bite and not just bark whenever the need arises. Mr. Adedoja is a former Minister of Youth and Sports, a former Commissioner for Sports and a former provost of the College of Education (Special) Oyo State. He was also the governorship candidate of the PDP in Oyo state in the 2015 election. Although Mr. Adedoja has signified his intention to run for national chairman, there seems to be little action from his end to show his seriousness for the office. Mr. Ladoja was governor of Oyo state. He was sworn into office on May 29, 2003. He was elected on the platform of the Peoples Democratic Party, PDP. Mr. Ladoja was impeached in January 2006 but was reinstated in December of the same year. Mr. Ladoja was wooed back to the PDP from Accord Party where he defected to following the crisis in the PDP. However, going by the provisions of the PDP constitution, he will need a waiver from the National Executive Committee, NEC, of the party to enable him be on the ballot on December 9. Mr. Ladoja appears to enjoy massive grassroots support but whether that is enough to get him elected by delegates at the PDP convention remains to be seen. A media mogul, Mr. Dokpesi is also a founding member of the PDP. He retired as chairman of Daar Communications Plc, owners of AIT and Raypower Television and Radio, to concentrate on his political career and aspirations. Mr. Dokpesi was perhaps the only candidate who traversed the length and breadth of the country to meet with delegates as he sought to emerge PDP Chairman before the ill-fated Port Harcourt National Convention. However, when, the leadership tussle of the PDP between former Chairman Ali Sheriff and Caretaker chairman, Ahmed Makarfi, defied solution, Mr. Dokpesi and others decided to form a new party, Advance Peoples Democratic Alliance, APDA. He was named the chairman of the Board of Trustees of the party. When the Supreme Court ruled in favour of Mr. Makarfi, Mr. Dokpesi retraced his steps back to the PDP. He sued APDA and its leadership following the crisis that engulfed the new party after PDP’s problems were over. Mr. Dokpesi has the character the PDP needs to displace APC in 2019. He can “bulldoze” his way and does not shy away taking decisions, no matter how unpopular. He challenged the leadership of the PDP and defied everyone in 2015 when it was decided that the office of national chairman should be micro-zoned to the South west. Although the micro-zoning arrangement is not playing out presently as it was in 2015, sources in the party say the next chairman of the PDP may likely come from the South west. This is because the party having already zoned the office of president to the north, it has also already agreed to pick a vice presidential candidate from the south east. Mr. Dokpesi, who has always preached that the PDP “should be returned to its original owners, the people, initially said delegates should be allowed to vote for whoever they want. Recent events have however shown that the media mogul has toned down his push for the coveted office. Like Mr. Ladoja, he would need a waiver to be on the ballot. It has also not been officially announced that he has resigned his membership of APDA. To cap it all, he was seen at the commissioning of the campaign office of Olabode George in Abuja, a few days ago, forcing Nigerians to wonder if he has decided to step down and support the former NPA chairman. He is also facing corruption charges in court. Like Mr. Dokpesi, Mr. Secondus is also from the South-South. He was a deputy national chairman and subsequently, acting chairman of the PDP. He was also a two-term chairman of the PDP in his native Rivers State. Mr. Secondus has a deep knowledge and workings of the PDP, a knowledge that may come in handy as he seeks to be the next chairman of the party. However, permutations within the party work against his aspirations. As pointed out earlier, the leadership of the PDP is disposed to producing a northern and south eastern pair of presidential candidate as such, it will be difficult to have a chairman from the South-south. That is not forgetting also that his region produced the immediate past president, in the person of Goodluck Jonathan.